A self-supported system, for applications in commercial or residential buildings. The system is installed to a builder’s kerb, finished by roofing membrane. This must be specified separately by others - not Roofglaze. Roofglaze recommend that an RG-80 Flatglass unit should be installed to a minimum pitch of 5° up to 5.5 m² and 10° over 5.5 m² in one panel. This is to help facilitate water runoff thus reducing water ponding and to help alleviate the build-up of silt deposits. Double with hermetically sealed glass, finished with 78mm sand blasted perimeter as standard but any size available upon request. 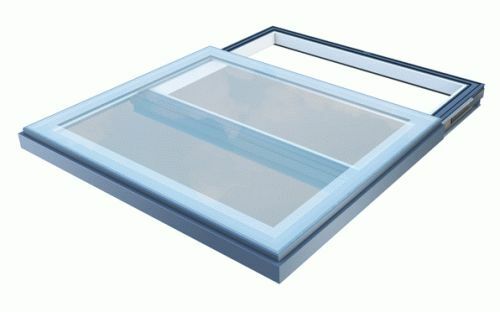 PVC-U Thermal Barrier to glazing frame. Non-Fragile to ACR [M]:001 Class B.
Frames are manufactured from extruded aluminium section to EN 12020-1:2001. Recommended 150 mm high, minimum 75 mm wide excluding finishes. Insert special requirement. Elliptical and irregular shaped rooflights are also available. Polyester powder coated RAL - Insert colour requirements, any RAL colour available. Sandblast all over coloured PVB interlayer satin glass. 15° kerb pitch or greater. Less than 15° kerb pitch. SGG COOL-LITE SKN solar control range. Single gang with temperature control. Double gang with temperature and rain sensor.